JUBA, Oct 3 2011 (IPS) - The communities living on the South Sudan-Sudan border may face genocide if the conflict between the two countries disputing control of oil reserves is not resolved. There have been recent clashes between the Sudanese army, Sudan Armed Forces (SAF) and the Sudan People’s Liberation Army-North (SPLA-N) in Sudan’s Southern Kordofan and Blue Nile states, as well as fighting between communities along the border. Southern Kordofan lies south of Sudan’s capital, Khartoum and borders the war-ravaged region of Darfur to the west. Blue Nile state lies south east of Khartoum and borders Ethiopia to the east. This comes as the communities in these oil states become progressively militarised with arms increasingly available to civilians, according to a report by a local non-governmental organisation. “One day the communities on the border may end up either facing genocide or there may be a very heavy war as the governments in both countries do not value the lives of the people but the resources they are sitting on. These resources will undermine the value of the lives of human beings,” Edmund Yakani, the coordinator for the local NGO Community Empowerment for Progress Organization (CEPO), told IPS. “The governments in the two countries look at the border from the perspective of economic gains rather than from the perspective of the communities living here,” he added. Yakani said the borders are important as the economic strength of the two countries is defined here. “If you talk about petroleum it is found here, at the border. That is why the (National Congress Party) NCP-led government in Khartoum is now saying that areas like Heglig, near Unity state, and Kaka, in Upper Nile state (where there is a high production of petroleum) are disputed areas,” he said. About 85 percent of the oil produced in Sudan and South Sudan combined comes from South Sudan. Much of the oil produced in South Sudan comes from the border states of Bentiu and Upper Nile. However, there is also oil in Jonglei state, which is in the interior. A CEPO report released on Sep. 17 found that the communities on the South Sudan-Sudan border are highly militarised and experience a lot of insecurity and violence. The report found that there was a “rapid flow of arms into the hands of the civil population” on the Sudanese side in order to instigate violence with those living across the border. “On the South Sudanese side civilians have acquired guns, supposedly for self-defence against – what they see as – Khartoum aggression and invasion,” the report said. This situation could eventually lead to a war. “The South has displayed extraordinary restraint in the face of extreme aggression from Khartoum,” Eric Reeves, a Sudan analyst and researcher at Smith College in the United States, told IPS. “It hasn’t responded with force despite continued bombing of its own territory that began almost a year ago last November, systematic assaults by military aircraft on Southern territory as well as the military seizure of Abyei; it has thus far avoided joining forces with the fighters in the Nuba Mountains of (South Kordofan) or in the Blue Nile. But this can only last for so long,” Reeves said. If Khartoum’s assault on the Sudanese-Ethiopian border town of Kurmuk – the dominant stronghold of the SPLA-N – continues, the likelihood of a united front between disparate forces fighting Sudan’s President Omar al-Bashir’s troops increases. 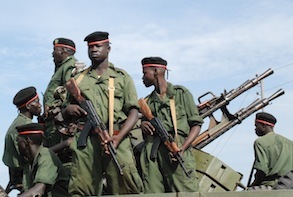 “A senior official of the SPLM-N, told me that many Northern soldiers have no stomach for this fight. This has caused Khartoum’s generals to rely more on the use of artillery, tankfire and military aircraft – which is a great way to kill civilians but not a strategic way to dislodge a military (guerilla) force. So we are definitely looking at a protracted conflict,” Reeves told IPS. “If South Sudan and the Nuba fighters link up with the SPLA-N military forces in Blue Nile and the rebels in Darfur, we will see a war stretching from the Chadian border to the Ethiopian border and potentially up the Eritrean border as well,” Reeves told IPS. The conflict has also affected oil production as oil contractors move away from areas of violence. Currently 98 percent of South Sudan’s revenue comes from oil. The reduced production is in three oil well blocks in Unity state where most of the country’s oil is found. Production in Melut in Upper Nile, which is not affected by violence, continues as normal. “On the Sudanese side of this area of the border, oil production has reduced from 60,000 bpd to only 48,000 barrels,” Gutbek added. Gutbek said that if production was normal, South Sudan would produce 300,000 bpd. He said amidst the violence it was not possible to provide security around the oil production areas and as a result “unknown people” were sabotaging the oil industry. “They cut cables in the fields and these then need to be fixed, which slows down the work and lowers the quantities of oil produced per day,” he said. Gutbek told IPS that if the violence continued the oil production would continue to decrease. However, he was hopeful that a solution would be found and the border area would be secured. “Some measures will be taken by the two governments in Juba and Khartoum to ensure that nothing interferes with the quantities of oil produced along the border. A security committee comprising officials from both Sudan and South Sudan has agreed to monitor the situation and improve security along the border area,” he said. Environmental economist and World Bank consultant on Private Sector Development in South Sudan, Spencer Kenyi told IPS that he believed the violence along the oil rich border would – as he put it – push South Sudan to develop its own oil infrastructure to avoid relying on Sudan. It had been a long-term plan of South Sudan, but the country may have to do this sooner than expected. “Although violence is not a welcome thing, it is going to create some positive move in South Sudan where the government will think about setting up its own oil, facilities like pipelines and refineries,” he said. South Sudan plans to build three refineries and has discussed as a 3,600 km pipeline from South Sudan to then Kenyan port of Lamu. South Sudan currently pays what it calls exorbitant fees for the use of Sudan’s pipelines and support services. The bulk of the infrastructure that supports the oil industry is in Sudan. Sudan has three refineries located in Khartoum, Port Sudan, and El-Obeid. The Khartoum refinery was expanded in 2006 from a capacity of 50,000 barrels per day to 100,000 bpd. The Port Sudan facility is located near the Red Sea and has a refining capacity of 21,700 bpd. “It will lead the government of South Sudan to refocus its strategy in the oil industry. They will speed up the idea of setting up transport systems for oil export from South Sudan in order to circumvent the violence that’s going on in the border areas,” Kenyi said. He added that if the violence continued South Sudan may have to completely shut down the oil sector, though temporarily. “The government may close the oil sector completely for a certain period and focus on areas like livestock farming and agriculture as the biggest income earner for the economy,” he said. He explained that this would in turn “break the back of the violent conflict arising out of the oil wealth along the border” and any subsequent efforts to demarcate the border will be much more amicable and peaceful. *Kanya D’Almeida in Washington contributed to this report.